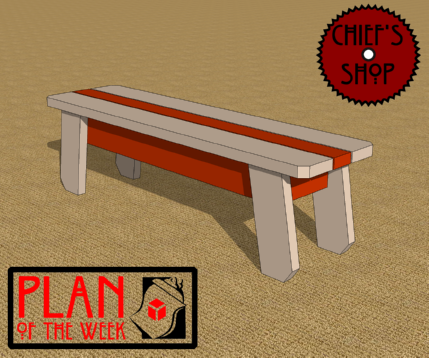 The Chief’s Shop Utility Bench can work in a lot of places, hence the “utility” in its name. I could see it used at the end of a bed, in a hallway, a mudroom, and even outside. The top and bottom of the legs are cut at a 10-degree angle, which is easy to do on a miter saw. Overall dimensions: 57 inches wide x 15 inches deep x 16 1/4 inches high. You’ll need a miter saw, drill driver, and Kreg Jig to build it. Lumber required includes a 2x4, and four 2x8s.